Why take bridal beauty supplements? Today marks exactly two months until my wedding day. To say I am excited would be a complete understatement. In the last week reality has well and truly sunk in about how close it is till I become Mrs Daines (swoon). Reality also kicked in that 8 weeks isn’t a lot of time in the world of bridal beauty when you really need to give your body time to adapt new regimes. So here the bridal beauty supplements I will be taking in the 8 week count down to my big day! (It can take 30 days for your body to start showing results from supplements so I would advise starting a minimum of two months before your wedding). First of all – why a collagen supplement? Simply put – Goodbye collagen = Hello wrinkles! 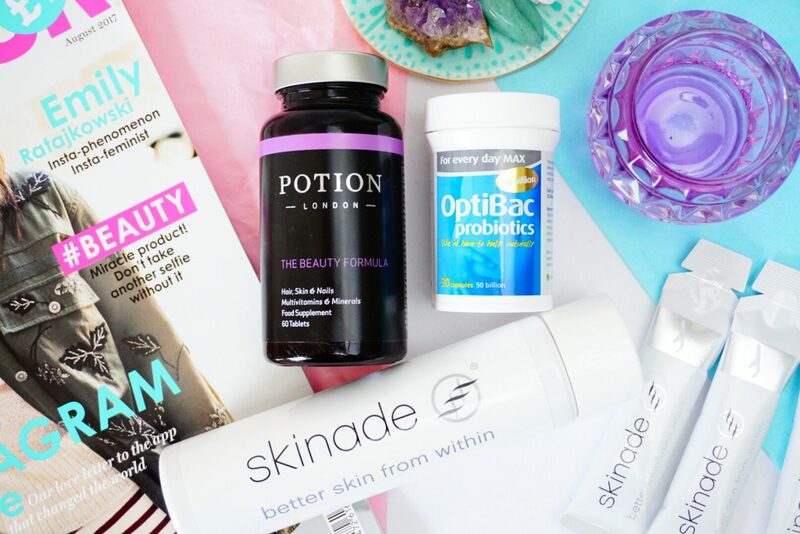 From the age of 25 (apx) our bodies stop producing collagen naturally, so replacing what we no longer produce with a supplement helps keep our skin tight and plump. Think of collagen as the scaffolding that stops your skin from collapsing. Second of all – why Skinade? Skinade is a multi-award winning, professional-level collagen daily skincare drink that has featured in Elle, InStyle, Tatler, Cosmo and many more. Skinade is a market leader in the world of collagen supplements because it delivers results. It boosts your body’s natural production of collagen and hyaluronic acid, and improves the way your skin looks and feels in as little as 30 days, it is a favourite in the world of bridal beauty. The key of Skinade is the level of bio-availability of the micro-nutrients. Skinade active ingredients are 100% in liquid solution allowing for an absorption rate of 95%. To consume the same level of essential nutrients and collagen peptides in tablet form you would have to take at least 20 large tablets. Collagen tablets are only partially absorbed, offering an absorption rate of only 30% to 40%. Results are more hydrated, radiant, clear, youthful looking skin for your wedding day. If you are wearing a wedding dress that shows some skin, Skinade will transform your skin on your whole face and body – a drink that works from the inside out. Why Probiotics? In short – probiotics look after your gut. They keep the good bacteria topped up, allowing everything to run smoothly, making sure your body absorbs all of its nutrients properly (including from other supplements). When your digestive system is experiencing problems, it can affect in your skin in many different ways; fatigued, dull, inflamed, puffy, irritated skin and all be connected to issues from your tummy. My number one must-have beauty supplement is high-quality probiotics. My skin can be quite reactive to stress, lack of sleep, dehydration which can result in redness and patches of eczema and dryness (imagine the run-up to the wedding!). Any type of inflammation in the skin leads to the dreaded AGEING. So rather than tackle the results of ageing, is it not best to tackle the cause? Not only that but I also get bloated very easily – probiotics can help ease irritation in your stomach and ward off the bloat for your big day. Why OptiBac? OptiBac specialise entirely in live cultures – their expertise in probiotics and prebiotics is what makes the OptiBac Probiotics range unique. 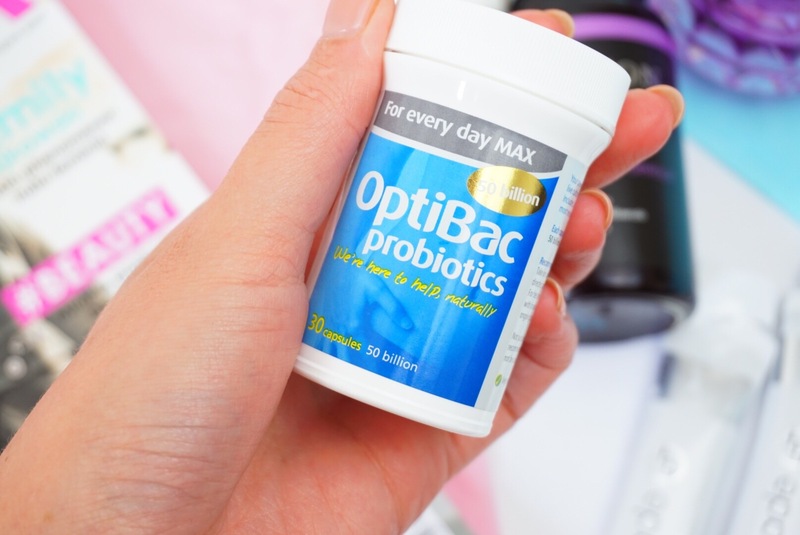 Whilst the OptiBac Probiotics supplements are not always the cheapest on the market – they are some of the best value products, certainly when you look at strength and quality. You can be assured with the amount of clinical research behind OptiBac’s probiotics that you are investing in a supplement that really works. I have the OptiBac Probiotics ‘For every day MAX’. This is the premium quality from the ‘For every day’ range. There are 50 billion live cultures containing 3 extensively researched strains; L. acidophilus NCFM®, B. lactis HN019 & B. lactis Bl-04. All 3 strains in ‘For every day MAX’ are scientifically proven to reach the gut alive; surviving gut acidity and bile salts. They have also been studied in numerous clinical trials; offering a high quality option to those looking for a high strength natural bacteria product. Furthermore, this product is vegan, does not require refrigeration and offers a guaranteed 50 billion live cultures per capsule until the end of expiry. The Beauty Formula from Potion London is a wonderful allrounder for bridal beauty. It will give your body a strong dose of vitamins & minerals that will strengthen your hair, skin and nails. My hair & nails are quite weak, so I am using The Beauty Formula to ensure they will be in the best condition for my wedding. 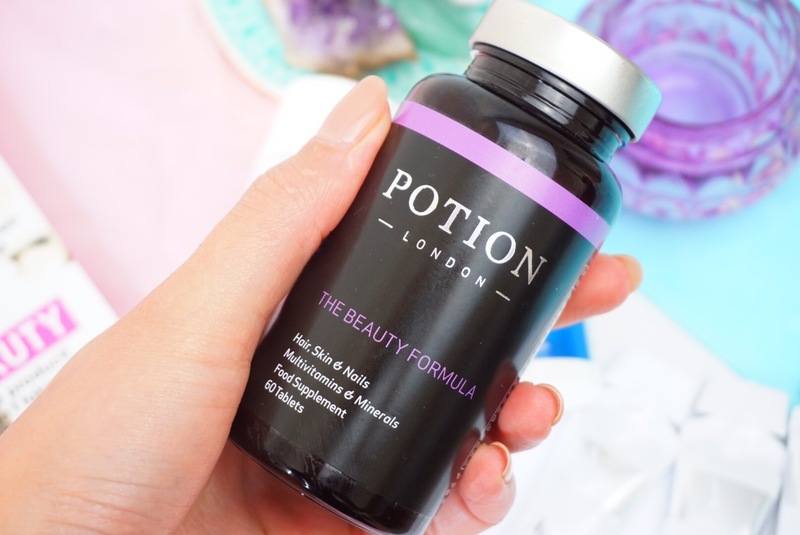 The Beauty Formula from Potion London is a specially formulated supplement to support healthy hair, skin and nails. Containing the optimum balance of 19 vitamins and minerals – developed specifically to promote clear and healthy skin, strong nails and beautiful, lustrous hair. Finally, the simplest supplement you can take is water. Up your water intake before the wedding to a minimum of 3 litres a day (especially if you are a coffee drinker like me, drinking tea & coffee is counterproductive as they make your body lose water). Hydration is everything for your skin – if you don’t want to spend money on any supplements, then make this one simple change. Water is the also the easiest thing to forget, make a conscious effort to drink more by breaking down how much water you need to drink every hour in your normal working day. One glass every hour between 9-6 should bring you to approximately 3litres, even set a reminder on your phone until you get in the habit. If you feel you want some extra help Amazon have these great water bottles with the hours marked out on them so you can see how much water you should be drinking each hour! Next Post Latest in Beauty Summer Sale is here, grab a bargain!